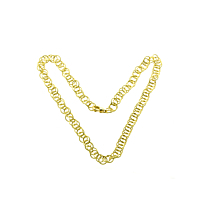 A stunning hand made necklace by Buccellati featuring a double link pattern crafted in 18k yellow gold. A sophisticated yet light and airy necklace perfect for everyday wear. By adding this tasteful necklace to your jewelry collection, you'll have an accessory that will make you forever trendy.